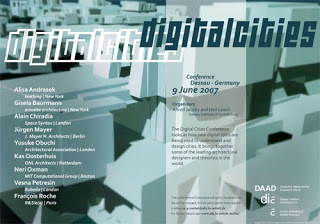 Neri Oxman lectured at the 'Digital Cities' conference held at the Bauhaus, Dessau in June, 2007. The conference was sponsored by DAAD. Other speakers included Gisela Baurmann - Büro NY, New York, Alain Chiaradia - Space Syntax, London, Jürgen Mayer - J. Mayer H Architects, Berlin, Yusuke Obuchi - DRL Architectural Association, London, Kas Oosterhuis - ONL Architects, Rotterdam, Matias del Campo - SPAN, François Roche - R&Sie(n), Paris and Neil Leach. Proceedings from the conference are to be published in an issue of Architectural Design entitled: 'Digital Cities'. Thank you Matias for the images.